Mega Sale! 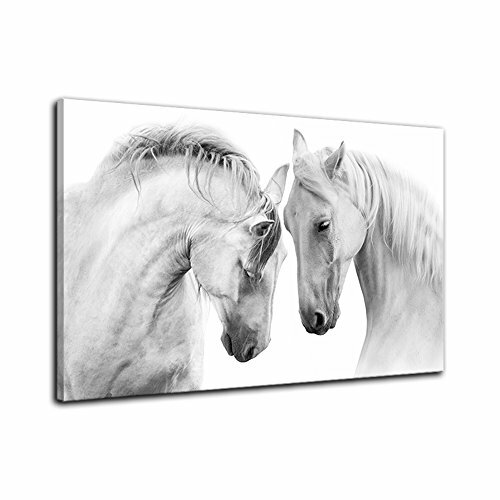 Save 29% on the Two Horse Wall Art of Animal Prints on Canvas Black and White Pictures for Living Room Decor Wall Artwork HD Prints For Home With Framed Stretched Ready to Hang by AMEMNY at Animal Backgrounds. Hurry! Limited time offer. Offer valid only while supplies last. Introduction: Firstly the canvas print art work is printed at high resolution on quality thick artist premium canvas with extra mirrored border. This design comes already framed and ready to hang. Each panel has a wide hook already attached for easy hanging. 30 days money back guarantee after receipt gives you assurance of a quality product at an affordable price. Well packed and dispatched fast via courier. Delivery Time 10-15 Working Days. Each canvas panel that we ship is handled with care, packed well in a solid cardboard box, and wrapped with plastic bag to hold it stable and avoid shipment damage. High resolution printing on premium artistic canvas, by using a high quality mirrored gallery wrapping technique which extends the picture all the way around the wooden frame. This creates an immersive 5D effect and makes the printed artwork look great wiout adding an expensive additional frame. And metal hanging hook(s) already nailed on frame the canvas art is ready to hang out of the box. A perfect wall decorations paintings for living room, bedroom, kitchen, office, Hotel, dining room, office, bar etc.. Due to different brand of monitors, actual wall art colors may be slightly different from the product image. If you have any questions about this product by AMEMNY, contact us by completing and submitting the form below. If you are looking for a specif part number, please include it with your message.